Congratulations to Debi9kids, IdahoJill, and Susanmeep. You have each won a sample of Choffy. Drink up! I didn’t start drinking coffee until I was in my mid to late twenties. Possibly sometime around the time that I began having kids. I drank it at work to get myself through the day, but without the luxury of flavored creamers , I improvised by adding half a pack of sugar free cocoa mix to my cup of coffee. Mmmm caffeine, but oh so chocolatey. If only there was coffee that was just naturally more chocolatey. 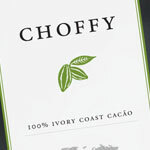 Recently, a fellow PSMM blogger, introduced me to Choffy. I received a sample of Choffy beans to brew as well as the most "spectacular, scrumptious, to-die-for, I-might-possibly-kill-for" truffle infused with Choffy. Let me preface by adding that generally, I am NOT a desserty type person. I can easily say no to chocolates. I can assure you I would never say no to a Choffy Truffle. Weeks later, I finally pulled out my Keurig adapter so that I could pour the Choffy beans right into my Keurig brewer. I was so happy to note the exact same rich taste as the truffle. Choffy is unsweetened so you add sweetener and cream to taste. I used two packets of splenda and skim milk. I’d probably use 1 packet of sweetener next time. I noticed the color of the Choffy was more milk colored than chocolately looking, but the rich chocolate taste was definitely present. I would bet that brewing a whole pot of Choffy as opposed to one cup would likely darken the appearance as well. This giveaway will close on January 22, 2011(11:59pm). Winners will be selected randomly by Random.org. ps Of course, I follow you here too. This looks yummy! I would love it for my Keurig, too! 2-I am a follower on google friend! 3-I am a follower on google friend! 4-I am a follower on google friend! 5-I am a follower on google friend! I am a follower on google friend!